DedicatedNow is a large private hosting provider founded in 1997 in Clifton, NJ. Since then it has been offering managed dedicated hosting solutions to personal users, small and mid-sized businesses as well as to big corporations. DedicatedNow is dedicated to providing highly dependable services, such as reseller hosting, e-commerce, web hosting cloud solutions, collocation hosting and more. Resources and tools designed by DedicatedNow are provided to beginners and high-end users with a goal to meet the requirements of both. They include basic server configurations and complex server environments with firewall safety, offsite backup, VPN access and access to SAN. DedicatedNow state that they invest a lot in building out their secure and reliable data center. According to the provider, it is supplied with the best facilities in the industry that maintain high technical standards. DedicatedNow has got a number of awards for their products and support being among top 10 web hosting companies for best dedicated server. They can also boast of having some leading companies among its clients. DedicatedNow has their own in-house data center located in New Jersey, several miles from NYC. Currently it exceeds 7,500 square feet of space with more than 5,000 square feet of office space. The data center is operated by different levels of security, breakdown proof facilities, fire suppression system, cooling systems, twenty-four-hour monitoring. (1) 160KVA Powerware, (2) 225KVA Liebert UPS units. DedicatedNow establishes itself as more than just a server hosting company. Focusing on server managing DedicatedNow is able to offer end-to-end managed hosting solutions, such as windows and linux options, load balancing, clustering, private cloud hosting, support for virtualized environments, high availability. Managed hosting, being a part of dedicated hosting service, is designed for businesses with no corporate staff to manage a server. The hosting services are comprised of the server, power, bandwidth and space, patch upgrades, server security, around-the-clock monitoring setup and maintenance. Solid Network and Infrastructure: DedicatedNow owns an advanced Tier III datacenter. Their multi-homed, all Tier I Cisco network is redundant down to the switch-port level and incorporates such carriers as Savvis, Global Crossing, Sprintm Level3, nLayer and Telia. Affordable Managed Dedicated Server Solutions: DedicatedNow is able to provide its solutions to both individuals and professionals, whether they are a small business or a large-scale company. For an affordable sum of money they can get dedicated servers to be maintained and monitored by the hosting provider. Cloud and Other Complex Solutions: in collaboration with OnApp (the leading cloud engine software) Dedicated Now offers managed private cloud platforms which are easily deployed and allow a customer to keep users and resources under control. Focusing on server management, the provider offers complex hosting that includes load balancing, clustering, backup solutions, managed firewall. 100% Uptime Guarantee: DedicatedNow promises to provide the highest uptime possible for all server customers due to its network infrastructure and hosting expertise. That is what keeps them among leaders in the managed hosting field. Regular Special Offers: DedicatedNow makes promotions on managed hosting and cloud hosting called Server Specials. 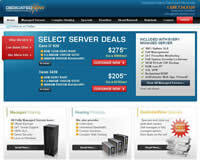 They are company’s new servers that listed at a lower cost for a limited time. Below you can read DedicatedNow reviews submitted by our site visitors who were (or used to be) DedicatedNow customers at the time of writing the review. I currently have 4 servers spread across three different cities and providers, my DedicatedNow server is by far the most reliable out of them all. The one time in the last 3 years when I experienced a problem support was excellent, despite the late hour – I was back online within minutes. First off a general statement – these guys are GREAT! Great price for the specs alone, let alone the quality of service. Network is amazing. Everyone that connects gets great response times… I HIGHLY Recommend these guys to anyone, looking a server with AMAZING support, an AMAZING network, and an overall amazing company to deal with. They have anything you need, from low to high end servers. After I appeared on the Tyra Banks show for my site popthatzit.com my site was swamped with traffic. The crew at dedicatednow kept my server running smoothly with over 20,000 visits a day.